Mythic Entertainment says a "paradigm shift" at the studio means the free-to-play battle arena game is no longer viable. Although it's been in open beta since April 2012, Mythic Entertainment announced today that Warhammer Online: Wrath of Heroes, an online battle arena spinoff of the Warhammer Online MMO, will not be launched. "Mythic as a studio is undergoing a paradigm shift as we shift our focus to mobile. As part of this pivot, we had to make a few changes and reallocate resources to support this new direction," the shutdown FAQ states. "As such, we took a long look at Wrath of Heroes and despite its strong IP, gameplay, and community support, we decided not to continue the service past its Beta and instead concentrate those resources on our new endeavors." 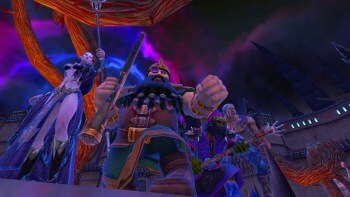 "The free-to-play battle arena version of Warhammer Online was a grand experiment. We were able to test new server technology, learn more about the free-to-play market, and engage in endless quick, down and dirty, three-way battles any time of day or night. On all of these fronts, we were able to make great inroads and insights and deliver a fast and frenetic game," Producer James Casey wrote in a farewell message. "As a producer for this game from the start, I am proud of the hard work and effort that made the game possible and I feel sad that it is not able to carry on." Several sites, including ShackNews, reported that the shutdown FAQ stated very bluntly that Wrath of Heroes "could not meet its financial goals to be sustained," but that line appears to have been excised from the document. Mythic also stated that while it will be releasing as many "work in progress" heroes as it can in order to help players burn through whatever Gems they may hold, refunds for leftover Gems will not be offered. Warhammer Online: Wrath of Heroes will close down for good on March 29.